New Delhi, April 6 (IANS) The BJP on Friday hit out at the Congress and other rival political parties opposed to its ideology and said that in its journey spanning 38 years, the ruling party had emerged as a "big platform for national unity". "The BJP is a big platform for national unity. It has one voice, one slogan, and one commitment -- to make the country a super power. 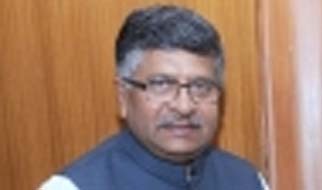 Today, the BJP is a party of all Indian and the party with all-India presence," Union Law Minister Ravi Shankar Prasad told reporters on the occasion of the party's 38th Foundation Day. Recalling former Prime Minister Atal Bihari Vajpayee's lines that "the cloud will go away, the sun will come up, and lotus will bloom", he said that the BJP at present rules the country with a clear majority and with its allies it is ruling in 21 of the 29 states. "The BJP has got 15 Chief Ministers and eight Deputy Chief Ministers. The BJP is ruling all northern states, except Punjab. We are ruling most of the northeastern states. We are ruling the hill states. Today, we are ruling 70 per cent of the country's geographical area," Prasad said. The BJP leader recalled the days when the party was dubbed isolated by the opposition and even during the 1980s attempts were made to remove its leaders from the Janata Party on the issue of duel membership. He said sacrifices made by BJP leaders and cadres had brought the party to its present situation. "The powerful energy that arose because of sacrifice of its workers has brought us here," he said. The Minister took a jibe at the Congress and its President Rahul Gandhi, saying if one has to grow in Indian politics, one has to embrace the country's soil, its culture and tradition. "Regardless of potential or talent, the top party leadership can go to a family only. I am not taking anyone's name, but the hint is clear," Prasad said. "In BJP, even a booth-level worker can be party President (Amit Shah). This is the specialty of the BJP. Throughout its journey, the party has focused on issues uniting the country," he said. He said broadly three categories of people opposed the BJP -- the Leftist, the Congress, and "chronic socialists other than Ram Manohar Lohia". "The BJP bashing has been a part of India's politics -- be it Nehru ji or Indira ji or leftists. See, where those who criticised us are today and where we are today. Our commitment was clear that we wanted to make the country a super power. He claimed that Narendra Modi came as a ray of hope for the people of the country and "we are proud that India is treated as a global power and the Prime Minister is treated as a global leader". He said BJP President Amit Shah had strengthened the party organisation. "The BJP's spread among the Dalits and tribals is his biggest achievement," the Minister said.